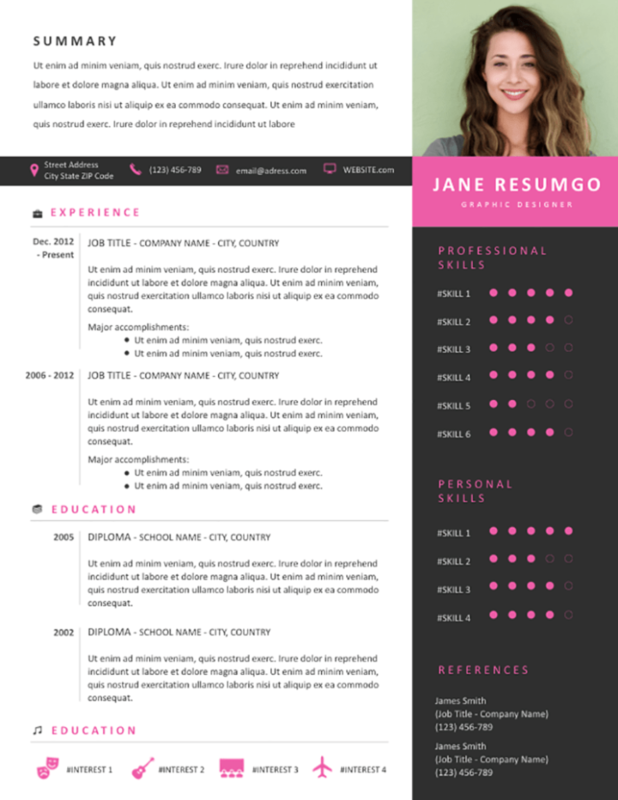 Ourania is a free modern resume template, with an eye-catching pink and gray right sidebar. 2-column structure layout. The left main part is neatly organized. Your summary/objectives statement comes on top. Then a dark gray banner used for your contact information brings a contrast to the lower part of this resume template. There go your experience and education path, and your interests/hobbies. The distinctive right side of the template uses a dark gray background and a pink ribbon as a placeholder for your name and title. Your professional and personal skills will stand-out thanks to the pink-colored equalizer-type dot charts that will nicely show for the level of expertise you have.